A former inmate sorted plastic products at Meredith-Springfield in Ludlow. LUDLOW — From the moment inmates are incarcerated in the Hampden County Correctional Center system, the Sheriff’s Department is preparing them to get out — and stay out. Shortly after they arrive, inmates get a manila folder for the vocational certificates and résumés they will be pushed to complete behind bars. Many earn the right to finish their sentences while living at home or in unlocked facilities, often holding down full-time jobs in the community. Once they are released, the ex-offenders have access to a support center in Springfield staffed by Sheriff’s Department employees and community service providers who help them with food stamps and housing, as well as haircuts, interview suits, and other resources. Hampden County is often held up as a national model for rehabilitating inmates. Pioneered by social worker-turned-county sheriff Michael Ashe, the program focuses on preparing inmates to join the workforce, often for the first time, while addressing mental illness, substance abuse, and other needs. Governor Charlie Baker recently proposed spending $1 million to expand the Western Massachusetts re-entry model statewide. “For a long time Hampden County has been looked at as a national leader,” said Benjamin Forman, research director at the Boston think tank MassINC, who recently coauthored a report on prison re-entry. Allowing inmates to work in the community before they are released has been shown to reduce recidivism. But because of the potential backlash if they escape or commit a crime, “It takes a sheriff with courage to do it,” Forman said. 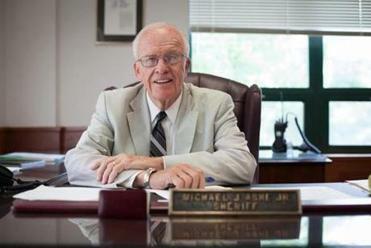 The Hampden County program was pioneered by Sheriff Michael Ashe (above), a former social worker. Most crimes are committed by repeat offenders, and efforts to reintegrate inmates into society — and keep them from committing crimes again — are on the rise. Last year, Massachusetts became the 29th state to join a Department of Justice initiative to reduce recidivism, and the Labor Department handed out $10 million in grants to ramp up inmate employment services, including $500,000 to the workforce board that partners with the Hampden County sheriff. Among the advances pioneered in the Western Massachusetts facility: day reporting that allows inmates out into the community while wearing an electronic ankle bracelet; transferring federal and state offenders back to their hometown jails so they can connect with jobs and services before they get out; connecting inmates to neighborhood health centers; and continuing to offer support services out in the community for people no longer in custody. These innovations came naturally to Ashe, who before becoming sheriff in 1975 was a house parent, along with his wife, for eight troubled children, in addition to raising six children of their own. The way he sees it, prisoners’ lack of freedom shouldn’t be compounded, it should be exploited. “Is it a warehouse or is it a corrections facility?” said Ashe, age 76, who is retiring this fall after nearly 42 years at the helm. Of the 1,500 inmates in Ashe’s custody on average, three-quarters are unemployed when they are arrested and nearly all lack marketable job skills. On average they read at the seventh-grade level. Edward, 38, is leaving the Hampden County jail in the fall with a résumé — his first — and a job. He also picked up parenting and leadership skills during his two-year sentence for selling cocaine, and is already helping support his wife and two young children, making $1,000 every two weeks at a nearby plastics factory. It’s a vastly different experience from Edward’s previous incarceration in Virginia, where he served three years on gun charges. He was released with no training or support, and eventually turned to dealing drugs. “I was lost,” he said. Three-quarters of people sentenced in Massachusetts have previous convictions, according to the Council of State Governments Justice Center. In Hampden County, a quarter of ex-offenders return to serve another sentence within three years, compared with nearly half in Suffolk County. The odds of ex-offenders committing another crime are much higher if they aren’t working. Two years after being released, twice as many unemployed ex-offenders commit another crime, compared with those who were working, according to the National Employment Law Project. The Hampden County correctional facility recently opened two in-house career centers, run by the state programs CareerPoint and FutureWorks, where inmates meet with counselors, complete online applications, and get screened for future training in construction and machining. Inmates spend 40 hours a week taking classes on anger management, substance abuse, job skills, and other topics to prepare them for the outside world. In return, they get “good time” knocked off their sentence. Before they get out, some inmates earn the right to be transferred to the county’s prerelease center, where there are no locks on the doors or razor wire around the perimeter. Along with attending employment workshops, they go out on job interviews, get drivers’ licenses, and can start working in the community. On a recent Thursday, Zenaida Smiley, assistant director of re-entry services, hosted a mock job fair for a dozen inmates, some dressed in shirts and ties, others in jeans and sneakers. Whatever you do, she told them, dress up, don’t bring an entourage, and don’t answer your cellphone when you’re talking to a potential employer. “I can’t tell you how many times I’ve seen pajama pants, or girlfriends pushing strollers,” she said. Ex-offenders feel such a connection to Hampden County’s program that hundreds of them attend a celebration with food, music, and dancing that the Sheriff’s Department holds every year to honor those successfully reintegrating into society. Hampden County’s program isn’t foolproof, of course. Jonathan, 29, is serving five years for selling heroin, his third incarceration and second shot in the county’s re-entry program. But this time, he’s determined to stay out. “This is my last merry-go,” he said. 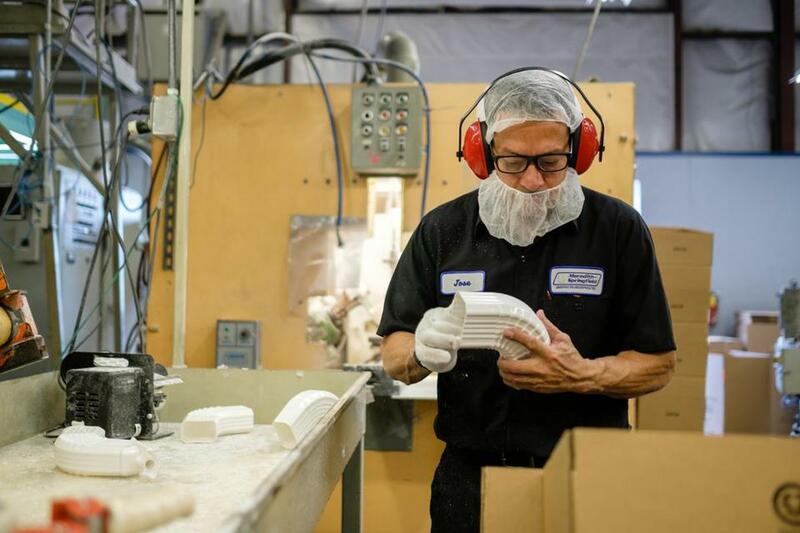 Mel O’Leary, chief executive of the Meredith-Springfield plastics company, has employed hundreds of Hampden County inmates over the years. They start off inspecting and packing containers and sometimes move up to being mechanics or fork lift operators. He has had few problems with the inmates, who are not supervised by jail staff while they work, and even uses the program as a selling point with potential customers. But he admits he was skeptical at first. “I was of the belief that people who break the law should be locked up and you should throw away the key and that rehabilitation is a pipe dream,” he said. One of his employees, Lesly, a 43-year-old Springfield native who served 11 years in federal prison for cocaine trafficking, was recently transferred to Hampden County to finish his sentence. Lesly lives with his mother and already has a state ID and attends church. He gets out at the end of the month, but Lesly said he already feels like part of the community again. A former inmate worked at Meredith-Springfield Associates in Ludlow. An anti-recidivism program pioneered by Hampden County has had drawn positive reviews.